Mr. Steere has been a member of our board since January 2013. Mr. Steere has been Chairman Emeritus of Pfizer since July 2001. He joined Pfizer in 1959 and held various positions, including Chief Executive Officer from 1991 until 2000; Chairman of the board of directors from 1992 until 2001; and member of the board of directors until 2011. 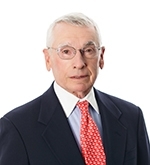 Mr. Steere also served on the boards of directors of Dow Jones & Company, Inc. until 2007; MetLife, Inc. until 2010; and Health Management Associates, Inc. until 2014.